EntreAmigos' annual fundraiser gala "Siembra que Florece" ("Turning Seeds into Flowers") is a fun evening where you can see this year's children's art exhibit, enjoy some tastings from local restaurants, catch up with friends over to a delicious three course meal all while supporting education and environmental awareness in our community. If you don't know the music of LeFunk, you're in for a special treat. 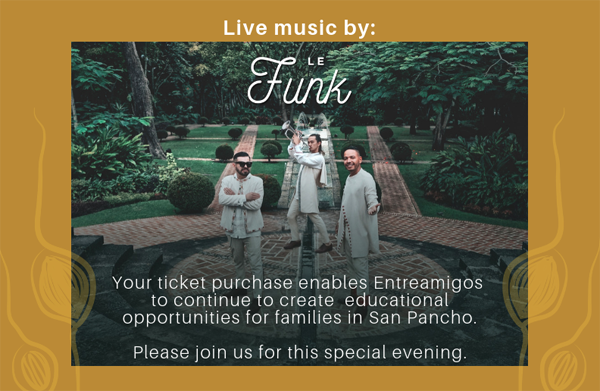 This amazing show band charges thousands of dollars for a perfomance and have offered to donate their services in support of the work of EntreAmigos. Your donation ticket of $100 US will include the three course dinner, two drinks from the bar, tastings from local restaurants, live music, raffle tickets and prizes. For more information, please contact Sarah Kaminshine at (311) 258-4377 or email info@entreamigos.org.mx. ALL PROCEEDS from this event will be used to support our important work during the summer.